Random Anny .Com: You know I love you, right Discover? You know I love you, right Discover? 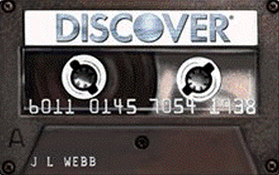 Yesterday's post made me realize I never discuss my Discover More card. The last time I really mentioned it was when I was signing up back in 2011. Well, its been a great two years and as long as they continue being fabulous they will continue being my card of choice! The rewards are AWESOME! I've successfully cashed in for credit on my statement several times. There is a cash limit in order to cash in (I believe its $50) but any amount of rewards can be cashed in at Amazon at checkout. As soon as I select Discover it auto-links to my account and tells me how much I have earned in rewards and asks if I want to use any/all of the rewards towards the purchase. Their on-line shopping mall is amazing too. I regularly get 5% back at almost any on-line store I visit and they will bump this up for holidays and other events up to 15%!!! When I signed up I knew I would have to sign up for bonus categories quarterly. This upcoming quarter gives me a BONUS 5% back on rewards any time I shop on-line! I buy almost everything on-line! Anyway, I was worried I would forget to sign up but turns out its pretty hard to forget. A month before the new quarter begins Discover will e-mail and text reminders, based on communication settings. All I do is log in, click "Enroll" and I'm set for three months. If a client can't be bothered to do it they don't deserve the bonuses! Plus look at the card design I picked - a cassette! Isn't that adorably wonderful!? They have hundreds of designs but this resonated. So if you are shopping for a new card go for a Discover More, its been two years of awesomeness here.